Top 10 Líderes. Eva Longoria. Cover Shoot. 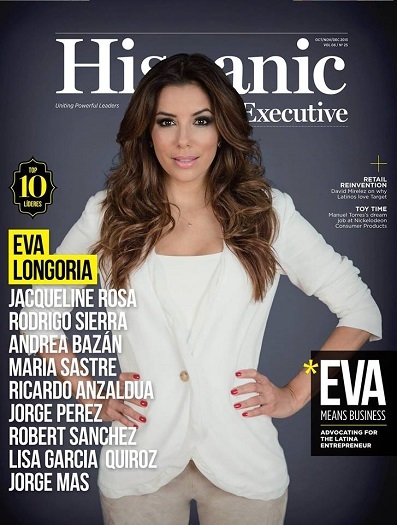 Hispanic Executive had the incredible honor of bringing Eva Longoria to Chicago for our Top 10 Líderes cover shoot, which took place at the end of June this year. 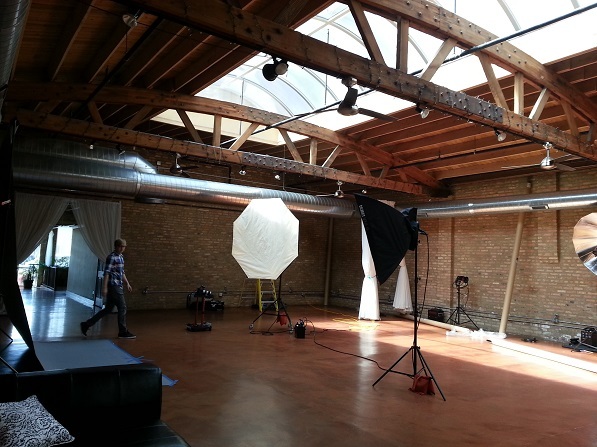 Shot on location at Loft on Lake Studio in Chicago’s West Loop, the photo session was nothing short of “frenzied fabulousity”. Shot by celebrity photographer Bryan Sheffield who flew in from Los Angeles and directed by our Publisher and CEO Chris Howe, Eva graciously shot three different looks in only 30 minutes. Talk about a posing pro! The first look we shot was for the cover with the idea that we wanted Eva to a look outside the glitz and glamour of the red carpet. We wanted her inner Latina entrepreneur to shine through. For this look, our wonderful stylist Jessica Sheehan of Evolve chose a white Helmut Lang blazer with Vince suede crème colored leggings (which Eva raved about!) paired with some fabulous Jimmy Choo heels. The second and third looks were for the inside spread of her feature where we wanted to spotlight the playful, fun side of Eva. She even let us plug in her iPod to get the mood just right while shooting, giving us a unique treat into her varying musical tastes! 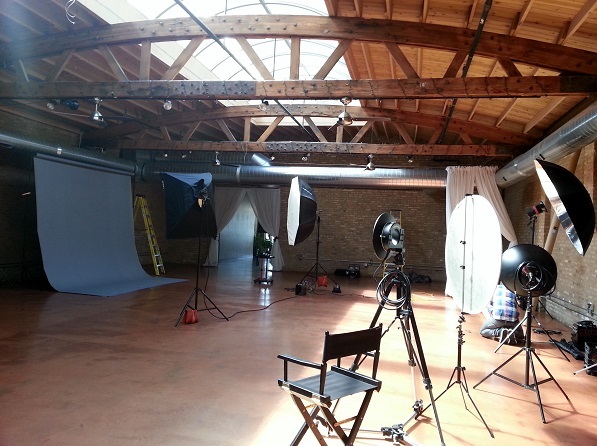 Check out some behind-the-scenes photos from Eva’s cover shoot below. Also don’t forget to catch our Fall issue featuring Eva Longoria along with our other nine remarkable líderes out this October! Art Direction by Chris Howe; Photography by Nest Artist’s Bryan Sheffield; Hair and make-up by Factors Artist’s Fredy Anaya; Styling by Jessica Sheehan of Evolve; Manicure onsite by Factor Artist’s Cenita Scott; Seamstress Vera Mamalat; Photo Assistant Evan Garrett of Loft on Lake Studio. Later that evening, Eva graciously made a guest appearance at the United States Hispanic Chamber of Commerce (USHCC)’s Kickoff Reception hosted by Hispanic Executive. Click here for the event re-cap! For more on the venue Loft on Lake, check out our sister publication Green Building & Design‘s article here. 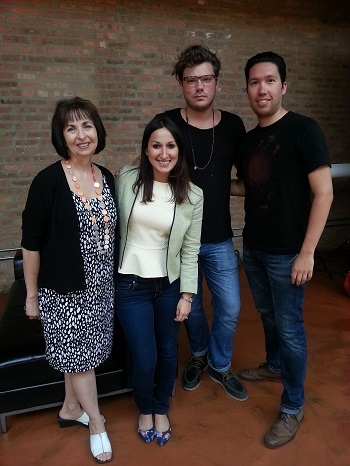 Team from Evolve Chicago preparing wardrobe for the shoot. 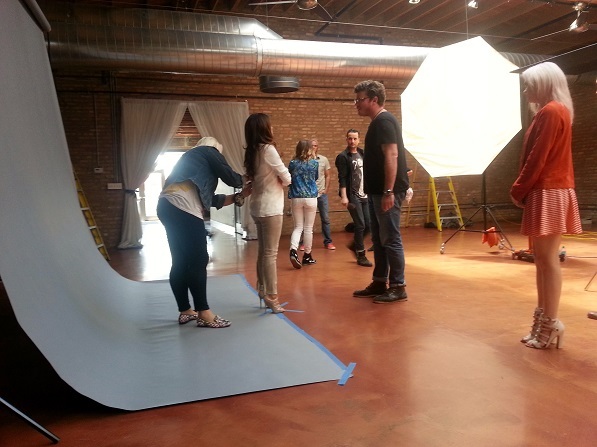 Eva Longoria posing for the inside spread of Hispanic Executive.